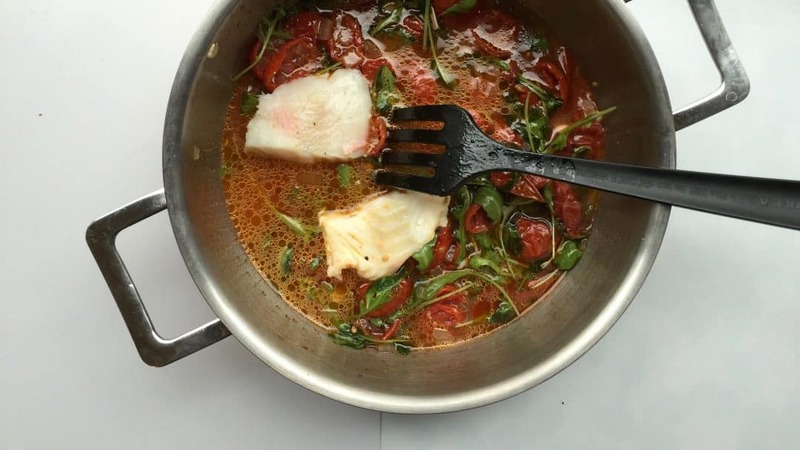 Sun Dried Tomato Soup Recipe with Cod & Arugula | Simple. Tasty. Good. 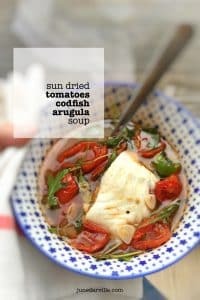 Check out this gorgeous and vibrant looking sun dried tomato soup recipe below… I still had 2 nice little fillets of fresh codfish left after preparing my delicious winter vegetable navarin with codfish at home for my visiting parents. So the next day I made this beauty with the leftovers for lunch: a powerful sun dried tomato soup recipe with arugula! It might seem like a lot of work but I kept this sun dried tomato soup recipe quite simple: I let the fish poach in the hot tomato soup for a couple of minutes. Easy. Boy how I liked that deeply concentrated flavor of those sun dried tomatoes! And to add some crunch, I just add a handful of chopped onion. Pine nuts would also be a great idea by the way. 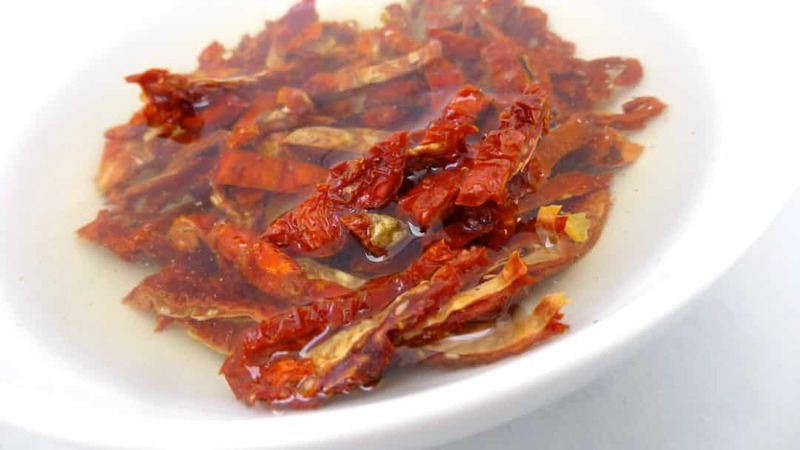 Love sun dried tomatoes? Then also take a look at another sun dried tomato recipe that I made a while ago: my creamy goat cheese and sun dried tomato tortellini! 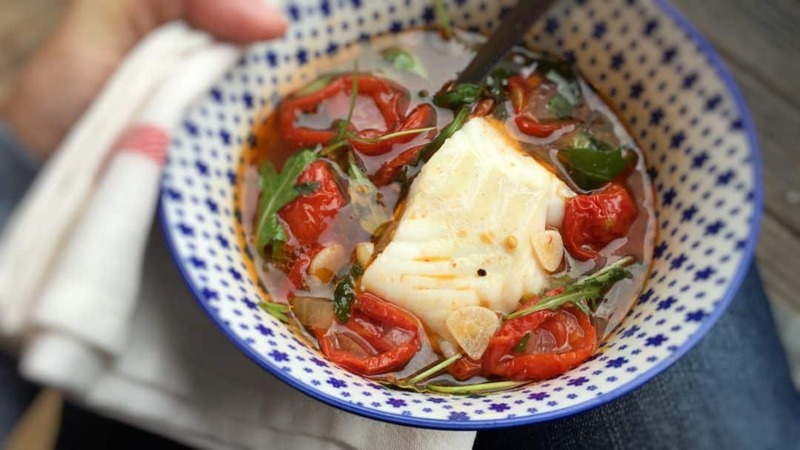 A 20-minute sun dried tomato soup recipe with fresh arugula and codfish! 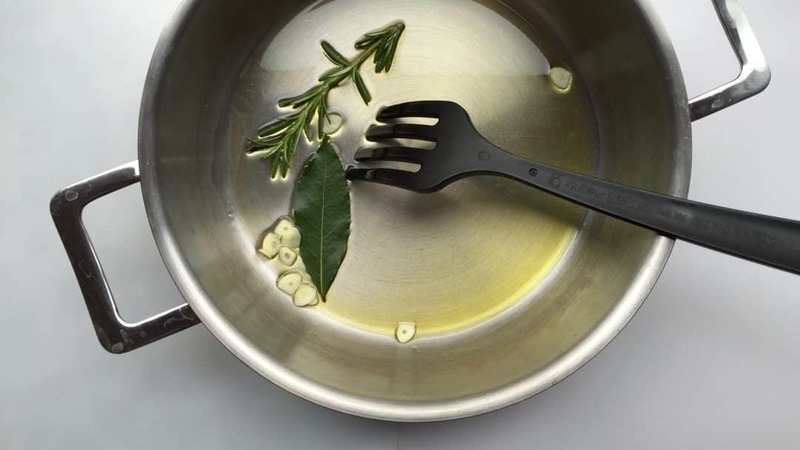 Add the olive oil, fresh rosemary, bay leaves and sliced garlic to a large casserole. Place it over medium heat until hot. Fry the garlic and herbs for 4 minutes. Then add the sun dried tomatoes. Stir and cook for 2 minutes. Then add the chicken stock. Season with a dash of pepper and a small pinch of salt. Stir the soup and bring the ingredients to a light simmer. Add the chopped onion and cook for 4 minutes. Now add the fresh arugula to the sun dried tomato soup. Then add the codfish fillets. Put a lid on the pan, turn the heat lower and let the fresh cod poach in the sun dried tomato soup for about 4 to 5 minutes until the fish is cooked through. Then check the seasoning of the soup and add extra pepper or salt to taste. Scoop the sun dried tomato soup recipe into large bowls and top each with a piece of the cooked codfish. Serve the soup hot. 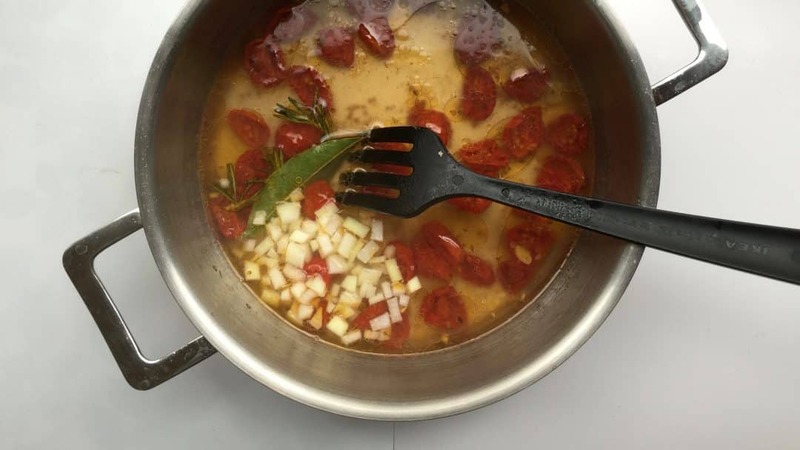 I hope that you enjoyed this sun dried tomato soup recipe as much as we do! Just in case you are looking for more sun dried tomato recipes: I have 2 more recipes for you in store here! I’m craving a sunny dish today for dinner: so how about making a bunch of sun dried tomato spaghetti! I recently came back from a little trip to Nice, France. There at an awesome farmers market near the seashore I bough this huge bag of delicious dark red sun dried tomatoes. I mean, this bag is huge so I’m on a mission to assemble great recipes with them! The ones I bought here in Nice are just kept in a plastic bag so that’s why I soak them in a little lukewarm water before using them to rehydrate them nicely. That will make the sun dried tomatoes much meatier and appetising in the end. But hey, feel free to use a jar of those sun dried tomatoes preserved in oil or brine! Chop the sun dried tomatoes up roughly. If you use dried tomatoes like I did, just soak them in a little lukewarm water for 10 minutes. If you bought sun dried tomatoes in oil or brine, skip this step! In the meantime place the pan with salted water over high heat until boiling. Then add the spaghetti and cook it until tender. 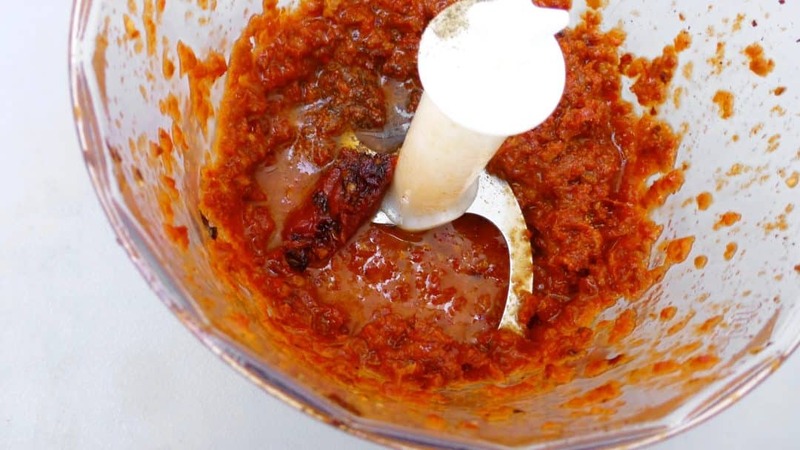 Add the chopped sun dried tomatoes and garlic paste to a blender. If you soaked the tomatoes in water, then squeeze them out gently and discard the soaking water. Blend the tomatoes and garlic. Season it with a pinch of pepper and salt. Pour in about 2 tablespoons of olive oil and blend again. Gradually add in more oil. Then add the tomato paste. Blend again. Check the seasoning of the sun dried tomato tapenade and add extra pepper or salt if necessary. Drain the cooked pasta and add it back to the pan. Then pour in the tomato tapenade. 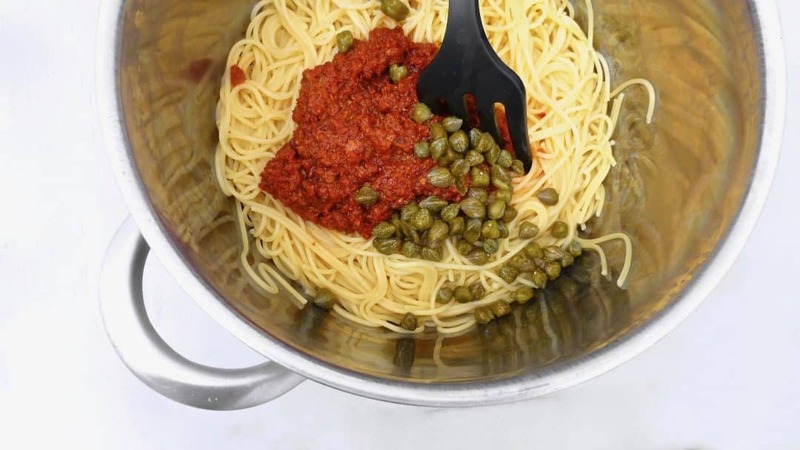 Also add the capers. Stir the pasta well. Transfer it onto deep plates and serve immediately. 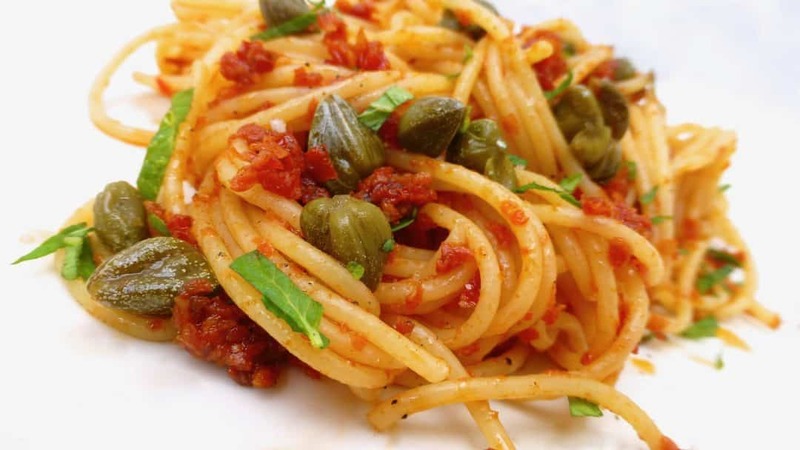 And here’s yet another sun dried tomato recipe for you to try out! And I’m sure that you will love this one: my easy sun dried tomato risotto, what a sunny Italian dish is this! This is a great recipe. 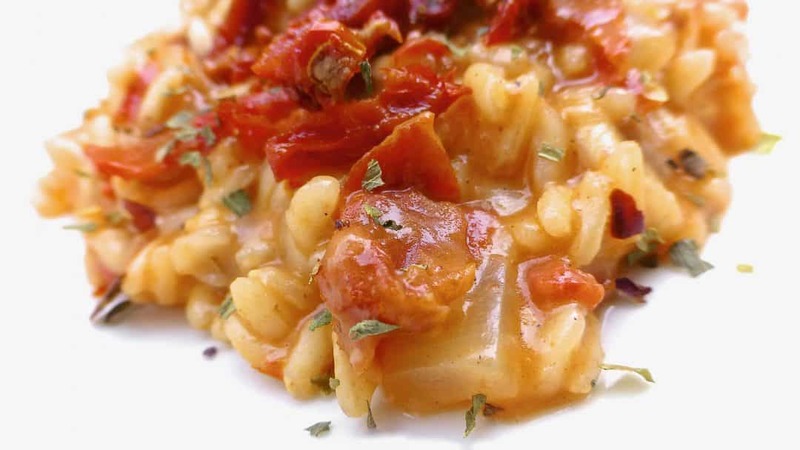 Very little ingredients are needed to prepare this risotto but boy, what a flavor explosion! 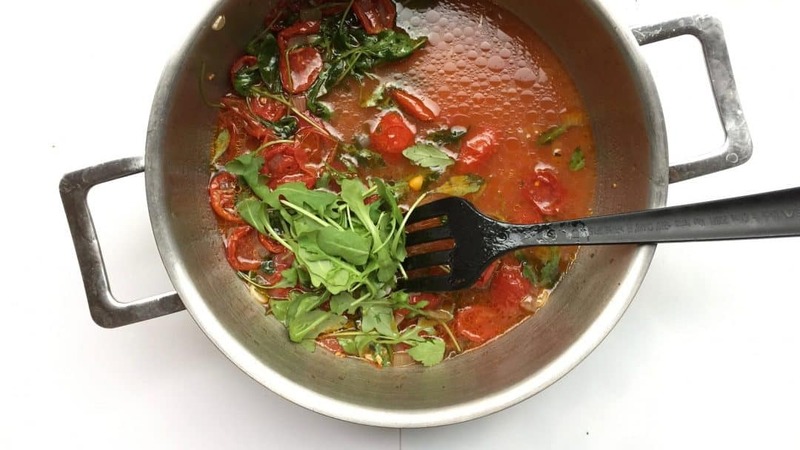 Make sure to add a good dash of pepper to this dish, it can use some heat that will go well with the deep hearty flavor of the sun dried tomatoes. If you use dried tomatoes, first soak them in lukewarm water for 10 minutes before you start. If you use sun dried tomatoes in oil or brine, skip this step! 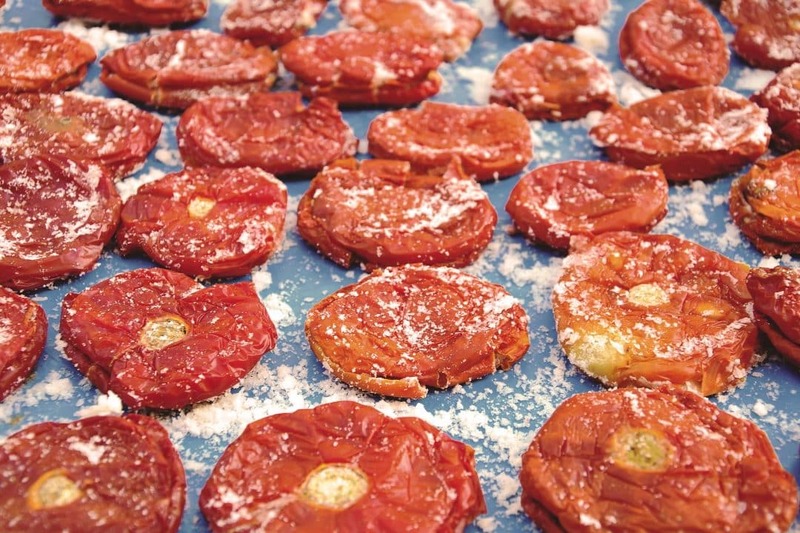 Transfer 5 of the sun dried (soaked) tomatoes to a clean blender and then add 3 tablespoons of the white wine. Blend the tomatoes until you get a chunky puree. Put it in the fridge until needed later. Peel and chop the garlic and onion. Pour the olive oil in a high non-stick pan and add the chopped onion and garlic. Place it over medium heat until the oil is hot. Season with a pinch of pepper and salt. Cook the garlic and onion for 4 minutes until fragrant. Then add the risotto rice to the pan and stir well. Cook the onion and rice for 2 minutes. Pour in some of the stock and stir. Bring the rice to a boil and then turn the heat low to a simmer. Add the sun dried tomato puree after 5 minutes. Gradually add splashes of white wine and stock until the risotto is al dente. In the meantime chop the remaining (soaked) sun dried tomatoes into thin strips. Remove the cooked sun dried tomato risotto from the heat and stir in the sliced sun dried tomatoes, the butter and grated parmesan cheese. Then check the seasoning of the risotto and add extra pepper or salt to taste if necessary. Scoop the risotto onto deep plates. Add a last dash of freshly ground black pepper and serve hot. 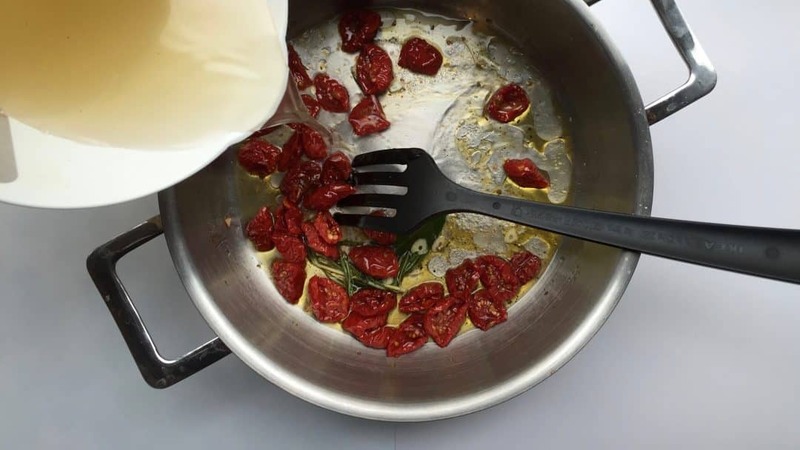 Do you know how to make sun dried tomatoes at home? If you have a dehydrator or know someone who has one, then you’re off to a good start! But hold your horses, you can also dry tomatoes in the oven, or even in the sun! 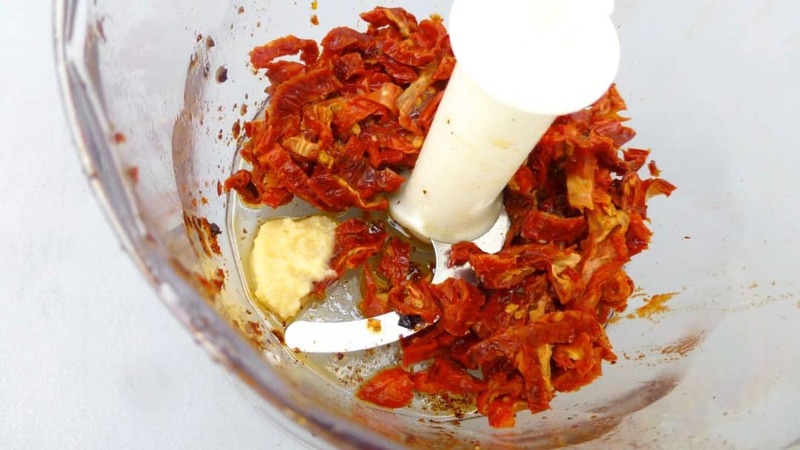 I’ll tell you in short how to make sun dried tomatoes. Maybe you have a vegetable garden and the tomato harvest is excellent this year. You might always end up with so many tomatoes that you don’t know how to use them all up before they go bad. 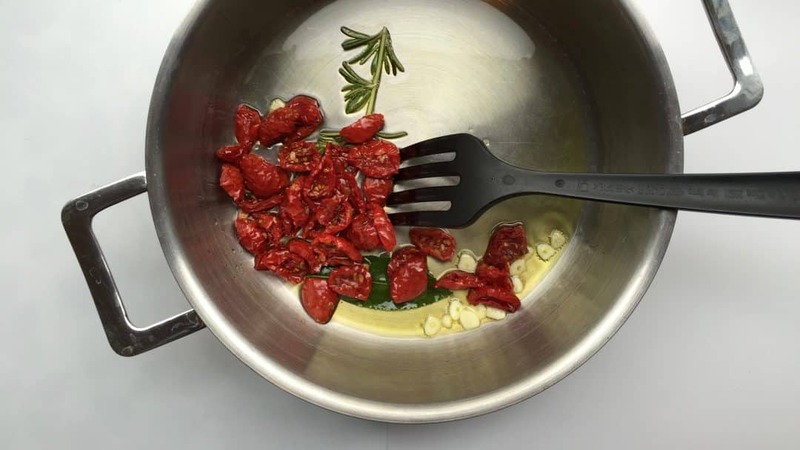 Here’s how to make your own sun dried tomatoes! Rinse the tomatoes and slice them in 4 bits. Remove the seeds and transfer the deseeded tomatoes to a large bowl. Sprinkle with some salt and a little olive oil. Stir the tomatoes and then divide them over dehydrator trays. Dry the tomatoes at 200°F (95°C). The tomatoes should be wrinkled and dried out in the end. Then let the dried tomatoes cool down fully at room temperature. Store the tomatoes in an airtight container or a plastic sealed bag in a dark and cool area. Preheat the oven to 200°F (95°C). Rinse the tomatoes and slice them in 4 bits. Remove the seeds and place the deseeded tomatoes on a large baking tray. Sprinkle the tomatoes with a little coarse salt. Then put the tray with the tomatoes in the hot oven and bake them until they are wrinkled and dried out in the end. Then let the dried tomatoes cool down fully at room temperature. Store the tomatoes in an airtight container or a plastic sealed bag in a dark and cool area. If you are living in a hot area, then you can also naturally dry tomatoes in the sun! Rinse the tomatoes and slice them up. Deseed them if you want. Then spread the sliced tomatoes over a clean surface like a baking tray or cookie sheet and sprinkle with a little salt and dried herbs. Then let the tomatoes dry out in a very sunny spot for a couple of days. They should be dried out in the end. Store the tomatoes in an airtight container or a plastic sealed bag in a dark and cool area. We love everything about this recipe: it’s easy, it’s healthy, it’s quick to make and it’s delicious and comforting! KU-DOS dear June!